Recently, eBay has had some great gift card deals. See here and here. Here is a recap of what I was able to buy with 2 paypal accounts (mine and my wife's). These deals are especially great for meeting credit card minimums. Total = $48.80 + $21.60 towards future purchases. In addition, I am now $1,080 closer towards a spending minimum. One of the problems with reselling is making sure the cards get to the company who is buying the cards. The cards are usually sent via regular mail. What happens if the company doesn't ever get the cards, or worse, what if someone at the company steals the cards and drains them quickly? It will be a big pain. SaveYa changes that. SaveYa seems to buy everything for the highest price according to Gift Card Granny. 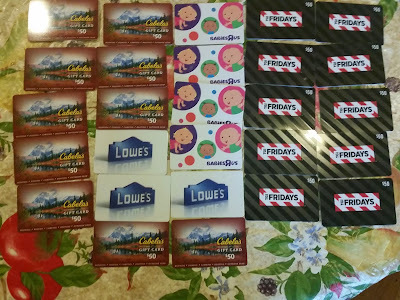 Also, instead of having to send in the cards, SaveYa buys the cards with just the card number and PIN. You can keep the cards at home. There is no chance for the cards to get lost or stolen. SaveYa turns easy money into Pajama Money!